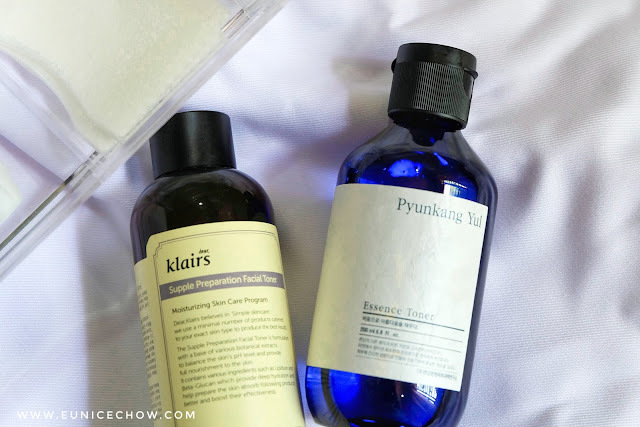 Toner Reviews: Pyunkang Yul Essence Toner V.S. Klairs Supple Preparation Facial Toner - Eunice C.
Hello readers, I’m back with a skincare review – a product comparison of the two most highly raved facial toners beauty bloggers swear by. 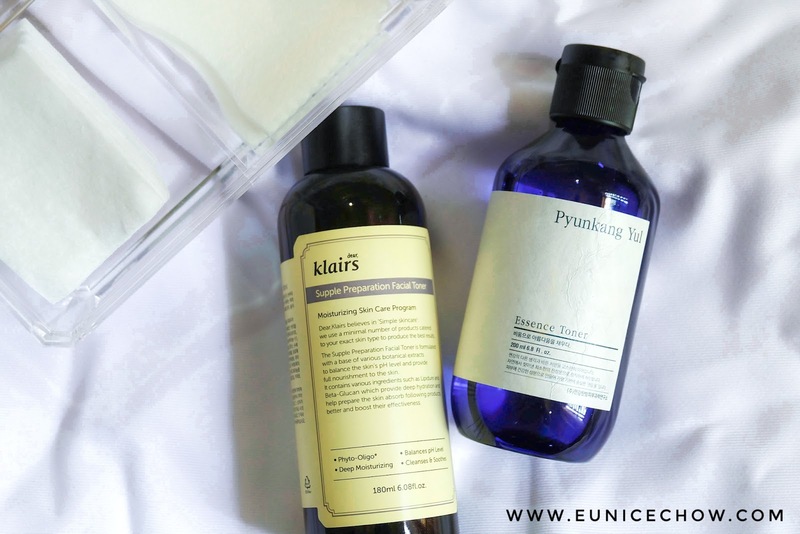 The Pyunkang Yul Essence Toner and Klairs Supple Preparation Facial Toner are one of the top hydrating toners currently trending on the Korean beauty scene. But do they worth the hype? Let’s find out! But first, here’s a brief introduction about toners. Toners help to remove residual impurities in the pores after cleansing, restore back skin’s pH, hydrates and soothes skin, and also act as astringents, depending on the active ingredients. 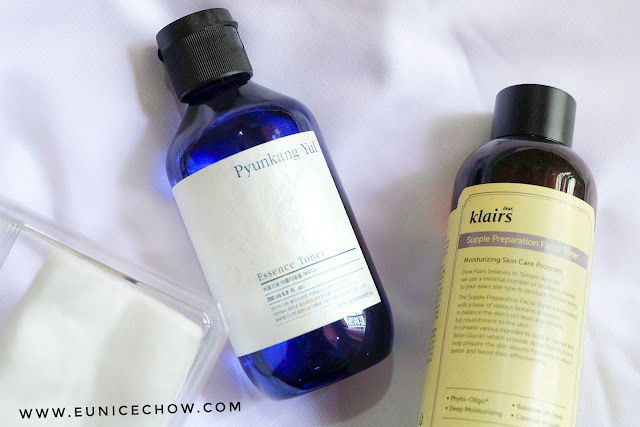 Both Pyunkang Yul Essence Toner and Klairs Supple Preparation Facial Toner are slightly thicker and more viscous in consistency relative to many other toners, resembling an essence or a serum. 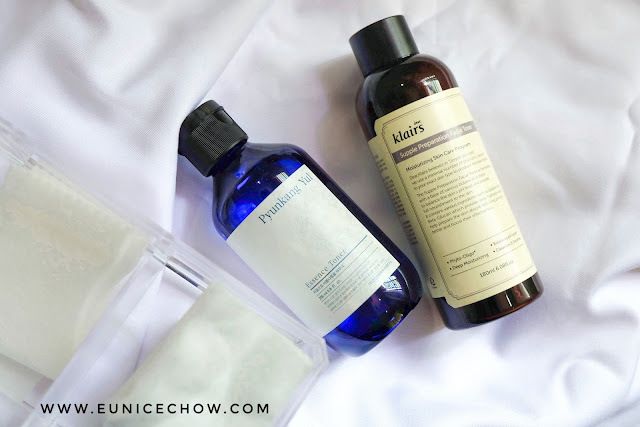 Both of these toners are loaded with many ingredients that are nourishing to the skin, unlike the harsh, alcohol-based traditional toners which only focus on providing astringent effect. Developed by the Pyunkang Oriental Medicine Clinic in Korea, a notable health institution specializing in atopic dermatitis, Pyunkang Yul is all about simplicity. 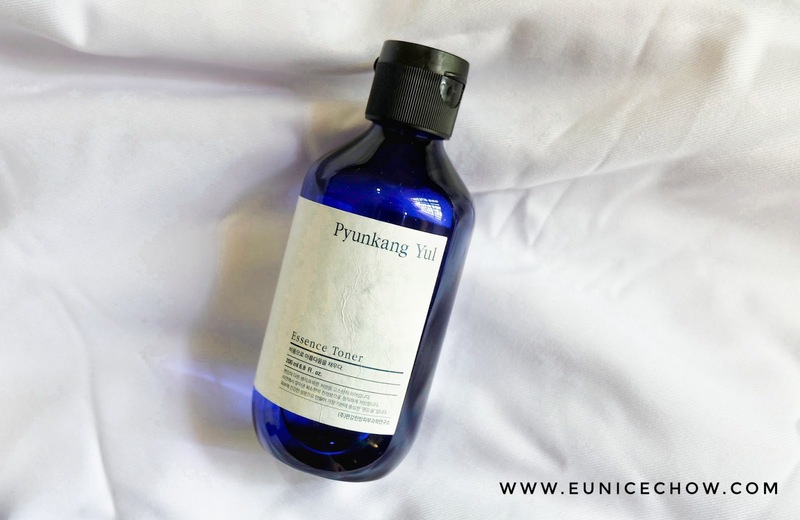 Pyunkang Yul takes pride in delivering skincare benefits using solely the main ingredients without the unnecessary addition of fragrances or any kind of additives that are likely to be skin irritants. I also like how the brand incorporates Korean traditional medicine into regular modern skincare regimen. 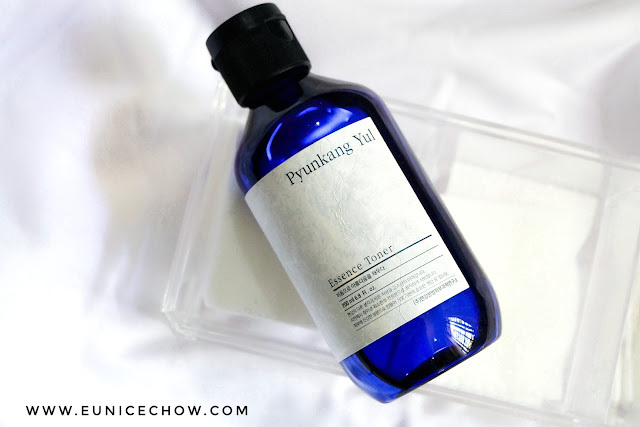 Pyunkang Yul’s basic line comes in a unique royal blue packaging labelled with a Korean traditional paper. It felt like I have a mythical elixir from the ancient times in my possession. How cool is that. Aside from the minimalistic packaging, the bottle has a shape of an antique apothecary glass bottle. It comes in a reasonable amount of 200ml/bottle. Its main ingredient, Milk Vetch (Astragalus Membranaceus) Root Extract is used in traditional medicine (even in Traditional Chinese Medicine) to cure ailments. Known for its anti-inflammatory and anti-oxidant properties, this root extract combats stress conditions in our body, boosts immune system, and is believed to have anti-cancer properties as well. However, according to Paula’s Choice, no evidence suggested that astragalus root extract has topical effects. It probably helps in terms of calming inflammatory condition of the skin. Butylene Glycol and Bis-PEG-18 Methyl Ether Dimethyl Silane are humectants, protecting skin barrier from moisture loss. Arginine, also an anti-oxidant, helps with skin hydration too. The list of ingredients are short too, living up to its simple concept. I ‘m quite surprised how lightweight the texture of this essence toner is. It is not as viscous as what I thought, judging from the name, “Essence Toner”. Pouring a drop of toner on the back of hand, the colourless liquid spread evenly and absorbed into my skin within a minute. It was completely scentless, like water. Overall, I’m very happy with this essence toner. It felt really good applying it on my skin. Using a piece of cotton pad, I poured a little (sometimes a little more) toner, and started dabbing on my skin. I can anticipate that a bottle of this essence toner can last me for a very long time. After using for only a month, it looks like it’s barely been used. I totally like everything about the consistency of this toner- lightweight, quick absorption, and completely scentless! Its moisturizing effect lasts long, as my face actually produces lesser sebum throughout the day. The price is very reasonable for a 200ml essence toner. I purchased it during an amazing promotion in Hermo with only RM40.09! It is currently priced at RM 62.10 at Hermo. Perhaps, there will be better deals ahead next time. Retail price : RM69.00. 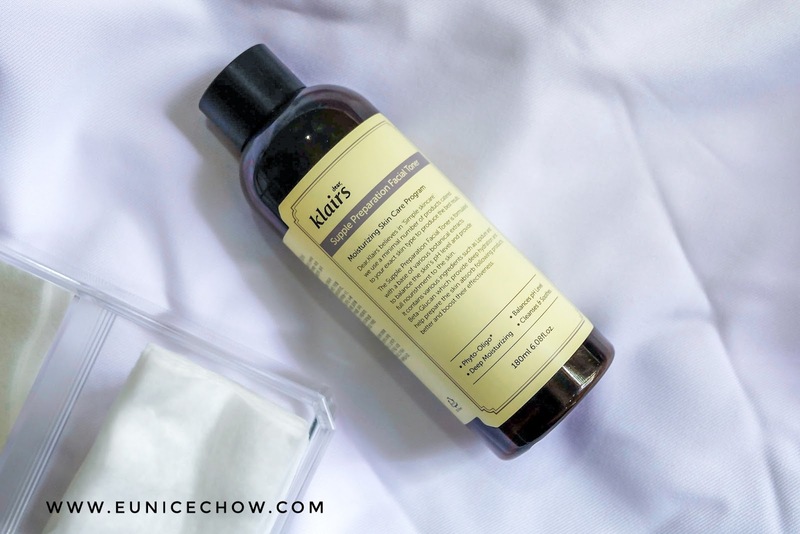 Also a brand of simplicity, Klairs vows to only provide the most necessary ingredients for skincare without the addition of colourants, alcohol, parabens, and frangrances. The brand also highly respects the environment and against animal testing. I like their skincare concept of incorporating nature’s raw ingredients/herbs into daily skincare routine. Contained in an amber coloured bottle, it comes in an amount of 180ml toner. The sleek amber coloured bottle is essential for preventing light oxidation of its natural ingredients. The bottle opening is much smaller than Pyunkang Yul’s, causing lesser products to flow. As you can see, Klairs Supple Preparation Toner has a long list of ingredients! Packed with plant extracts and a wide array of essential oils, it is important to know the function and benefits of each ingredient listed here. 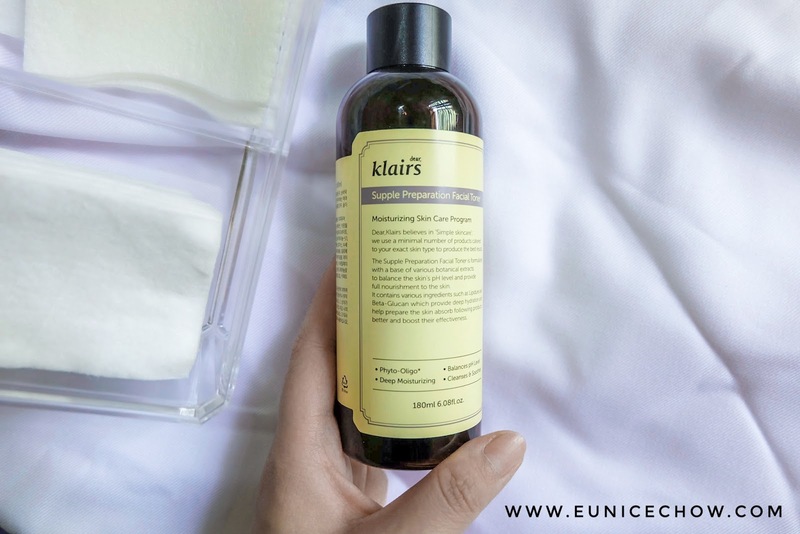 Not all ingredients cater the needs of your skin type, even though Klairs claimed this product is suitable for all skin types. Centella asiatica (commonly known as Pegaga in Malaysia) has known health benefits when consumed, and in cosmetology, it is known to promote wound healing, hydration, and has anti-aging properties. Glycyrrhiza Glabra (Licorice) Root Extract has anti-acne properties while Portulaca Oleracea Extract has antioxidant properties, protecting skin from environmental damage. It also contains vitamin C and E in the form of Tocopheryl Acetate and Sodium Ascorbyl Phosphate which are powerful anti-oxidants. This toner is also loaded with tons of emollient and skin conditioning agents such as Luffa Cylindrica Fruit/Leaf/Stem Extract, Butylene Glycol, Betaine, Caprylic/Capric Triglyceride, Sodium Hyaluronate, Panthenol, Arginine, Lysine HCL, Proline, Acetyl Methionine, and Theanine, which is why it is so moisturizing. And not forgetting the long list of essential oils- Lavandula Angustifolia (Lavender) Oil, Eucalyptus Globulus Leaf Oil, Pelargonium Graveolens Flower Oil, Citrus Limon (Lemon) Peel Oil, Citrus Aurantium Dulcis (Orange) Peel Oil, Cananga Odorata Flower Oil which mainly contributed to the fragrance of this product. The consistency of this product is much thicker and viscous than the Pyunkang Yul’s essence toner, probably because it contains more bulking and viscosity increasing agents. 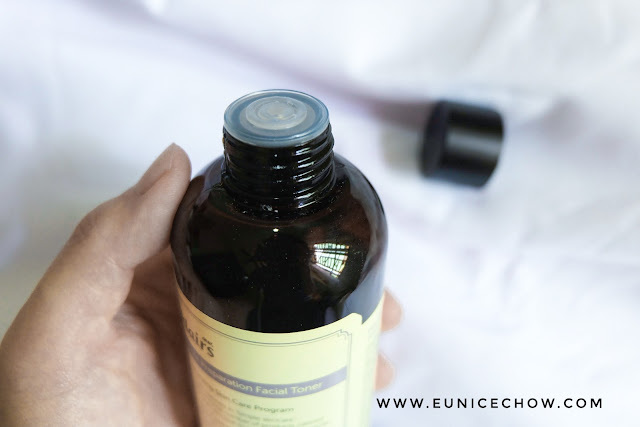 Its absorption rate into the skin is slightly slower compared to Pyunkang Yul’s essence toner. However, it did not leave a sticky finish on my face. It also has a fairly strong herbal scent. At first, I was very much attracted to the list of natural ingredients. Those fancy natural extract sounds like good stuff for skin and convincing enough for me to give it a try. I read that essential oils (fragrant oils) does more harm than good in the long run. You may read more in here . Essential oils can cause skin irritation and damage especially for sensitive skin types. 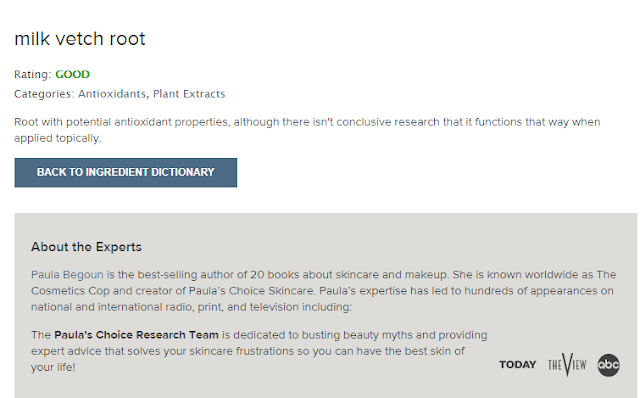 Paula’s choice also advised to avoid any skincare products that contain fragrant plant oils and extracts. I did not experience any skin irritation. It was calming and soothing to my skin. However, its moisturizing effect diminished after a few hours of application. My face became oily easily as sebum production was not very well regulated. All in all, it did not produce desirable effects to me. It is currently priced at RM 63.50 (inclusive of 6% GST) at Hermo. I bought at RM75.57 during the non-promotional period. Retail price: RM128.00. What I like & dislike? 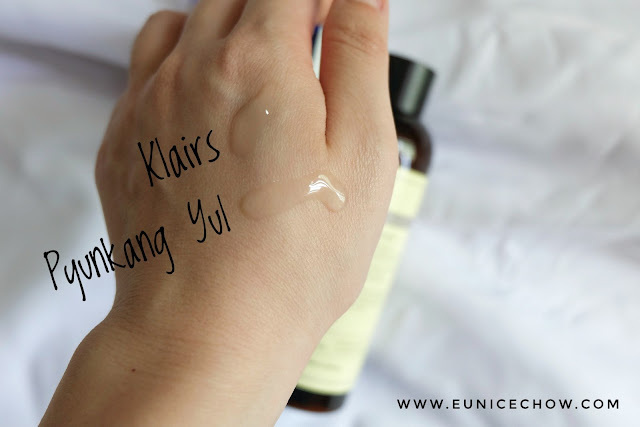 Consistency- I like Pyunkang Yul’s lightweight toner as it absorbs better into my skin. Klairs Supple Preparation Toner was slightly viscous, making it slower to absorb into my skin. 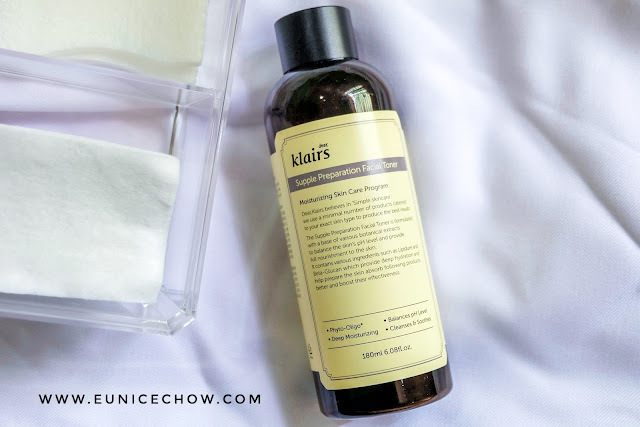 Fragrance- Klairs Supple Preparation Toner fragrance did not really bother me. However, I still prefer unscented toner to prevent any skin irritation. Pyunkang Yul scored one point for this aspect. Moisturizing effect- Pyunkang Yul’s essence toner did a better job in retaining moisture and controlling sebum production for my skin. 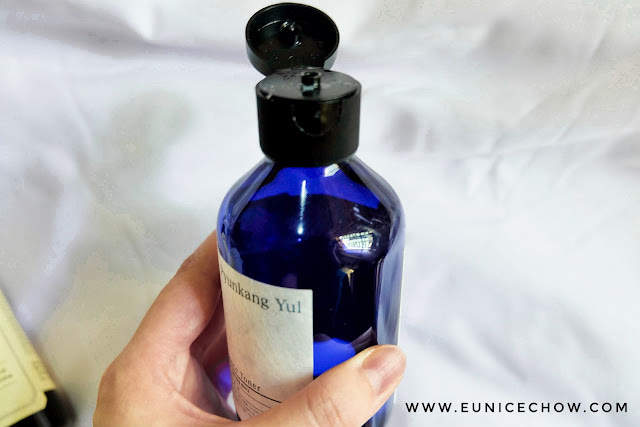 Pyunkang Yul’s essence toner is definitely value for money. It did such an excellent job in keeping my skin hydrated and lower my sebum production throughout the day. Even though Klairs Supple Preparation Toner garnered over a thousand positive reviews on Hermo and heavily recommended by Wishtrend TV, many beauty bloggers, and Korean skincare aficionados, it did not work on my skin. I would prefer toners without the addition of essential oil for oily, acne prone, and sensitive skin. And, the good news is Klairs is launching an unscented version of Klairs Supple Preparation Toner this month! It is probably worth checking it out, and maybe give Klairs a second chance.